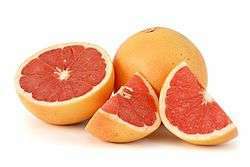 Grapefruit juice is important in medicine because of its interactions with many common drugs including caffeine and medications, which can alter how they behave in the body. Grapefruit and grapefruit juice have been found to interact with numerous drugs, in many cases resulting in adverse effects. This happens in two ways: one is that grapefruit can block an enzyme which metabolizes medication, and if the drug is not metabolized, then the level of the drug in the blood can become too high leading to an adverse effect; the other effect is that grapefruit can block the absorption of drugs in the intestine, and if the drug is not absorbed, then not enough of it is in the blood to have a therapeutic effect. ↑ Fellers PJ, Nikdel S, Lee HS (August 1990). 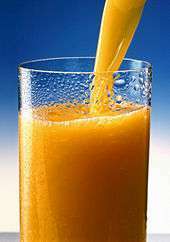 "Nutrient content and nutrition labeling of several processed Florida citrus juice products". Journal of the American Dietetic Association. 90 (8): 1079–84. PMID 2380455. ↑ Bailey DG, Dresser G, Arnold JM (March 2013). "Grapefruit-medication interactions: forbidden fruit or avoidable consequences?". CMAJ. 185 (4): 309–16. doi:10.1503/cmaj.120951. PMC 3589309 . PMID 23184849. 1 2 3 4 5 6 Mitchell, Steve (19 February 2016). "Why Grapefruit and Medication Can Be a Dangerous Mix". Consumer Reports. Retrieved 4 May 2016. ↑ Bailey, D. G.; Dresser, G.; Arnold, J. M. O. (2012). "Grapefruit-medication interactions: Forbidden fruit or avoidable consequences?". Canadian Medical Association Journal. 185 (4): 309–316. doi:10.1503/cmaj.120951. ISSN 0820-3946.